In 1988, Five Guys Named Moe was formed as a result of several friends / musicians with the desire to get together and play some kickin’ music with a twist…they wanted to entertain people in addition to playing or performing for them! They wanted to make it fun for everyone including themselves. The MOES WIDE VARIETY OF MUSIC ranges from blues, rock, funk and soul to rhythm & blues including Covers and Originals. The MOES invite you to join them for some great music, good times and our strong following of fans called The Moe-Heads. So you can experience for yourself what is called “MOE-OLOGY”! Jose’ Rivera, (BIG-MOE), is the founder / leader of the MOES. Jose’ serves as lead vocalist for the MOES, doubling on trumpet, flugelhorn, pocket trumpet, flute, bongos, congas, timbales and vibra-slap. Jose’s strong upper register horn playing dates back to his early days as Section Leader and Soloist for the United States Marine Corps. Where he performed before Presidents and numerous Heads of State between the years of 1972-1977. He traveled over 100,000 air miles a year touring the country and performing in 300 events per year. Along with sharing the stage with Trumpet greats Doc Severinsen at the Michigan State Fair and Al Hirt at the grand opening of the Superdome in New Orleans. Since coming back to Chicago, Jose’ has appeared with many local bands. From jazz bands to big bands as well as concert bands, marching bands, drum & bugle corps and rock bands until he founded and formed the group Five Guys Named Moe. His natural talent on vocals, multiple trumpets, flute and percussion stems from his strong Latin Origin with a wee bit of Irish. Jose’s influences on trumpet include Arturo Sandoval, Rafael Mendez, Maynard Ferguson, Bill Chase, Al Hirt, Doc Severinsen, and Herb Alpert. On percussion his influences have been Raul Rekow, Karl Perazzo, Armando Peraza and Joe Mesello. Another original member of the MOES is Bob Muraida, (SLOW-MOE). Bob provides the band with a strong bottom end bass sound as well as strong lead and background vocals. He has performed with various bands since 1973, first as a lead singer then doubling on bass and vocals after 1976. Some of the bands Bob has appeared in include Badge, Union and In-Sync. Bob has been with Five Guys Named Moe since the beginning. Bob’s playing styles cover pop, rock to swing and heavy funk. The main influences on Bob’s musical style are George Cassas, Tiran Porter and the always electrifying Jose’ Rivera! On Lead Guitar, Rhythm Guitar and Vocals for the MOES is Frank Capek, (FRANKEN-MOE). He’s a Monster on guitar! As an accomplished guitarist, Frank is experienced in all types of music. Frank’s most notable contributions have been in the fields of Blues and Rock. Frank was with a group called The Kind in the 80’s. They had two albums which produced several hits as well as they went on tour to promote their albums. Frank has toured with the following bands: The Kind, Lovecraft, Lonesome City Kings and Backstreet. Frank also has a discography consisting of six albums. Frank has performed, toured and/or recorded with the following artists: Freddy King, Buddy Guy, James Cotton, Jimmy Rogers, Muddy Waters, Howlin’ Wolf, Paul Butterfield, Sam Lay, Johnny Young, Eddie Campbell, Big John Horton and of course the always inspiring Jose’ Rivera! On the piano, organ Gerry Burns, (GERONA-MOE). Gerry started performing at the age of 16 at nightclubs throughout the south side of Chicago. The Bands Streetwise, Side Effects, Third Floor and the Burns Brothers Band. They were just a few of the early groups that he and his brother Tim Burns developed. Gerry studied music theory and classical piano with Professor Ted Berg of Daley College and continued his education at DePaul University under the direction of the Chicago Symphony pianist Mary Sauer. Shortly after the conception of Five Guys Named Moe Gerry joined the band and for eight years the Moe-Heads (our fans) knew him as KEY-MOE. He then took a sabbatical from the Moe’s to form a traveling group called 215West. The group toured the United States, South America, Asia and Europe. Fourteen years later Gerry returns to the Moe’s as GERONA-MOE. Gerry’s influences are varied and still growing. Not to mention the always entertaining, Jose’ Rivera! On Drums and Vocals, for the MOES, is Paul Townsend, (EL-MOE). A graduate of Berklee College of Music 94′ in performance. Paul brings over 20 years of experience in various styles of playing drums. Including Jazz, Latin, Fusion, Progressive Metal, Death Metal, R&B, Grunge, Pop rock, Hard rock and Blues. Paul has played with JP and the Cats, (pre-Berklee) for 6 months filling in for Jimmy Chamberlain of Smashing Pumpkins. He has played with Deep Blue Dream, Blues Victim, The Masses, Stawhouse, Lickity Split, Nova Soul, Joel Moore Quartet, Shawn Maxwell Quartet, Agnieszka Iwanska Group and most recently Five Guys Named Moe. Paul is influenced by the music of Frank Zappa, Led Zeppelin, The Who, XTC, David Berne, James Brown, John Zorn, Naked City, Masada, Bill Frisell, Yes, Rush, AC/DC, early Van Halen, Iron Maiden, Rammstein Gonzalo Rubalcaba, Tito Puente, Opeth, Meshuggah, Porcupine Tree, Miles Davis, Tony Williams, Pat Metheny, They Might Be Giants, Steve Coleman, John Coltrane, J.S. Bach and don’t forget about the amazing Jose’ Rivera! So come out and join the fun and see and hear why people are talking about FIVE GUYS NAMED MOE and “MOE-OLOGY”. 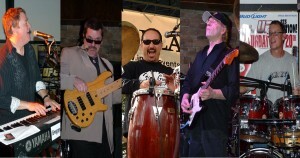 Come see for yourself why they are one of the most popular bands in the Chicagoland area. We’re a great band to sing dance and drink beer with!